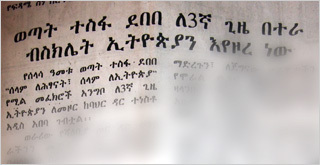 Ethiopian songs, theaters. books, and paintings usually send messages full of melancholy, tragedy and sadness. Love songs express the ultimate suffering of the involved pair. Singing about bleeding hearts, broken bones, tormented bodies and lost minds are traditionally the best way to show how genuine that particular love is. By listening, reading and seeing our work of art, one would mistakenly categorize us as the most traumatized, humorless and sad population. Fortunately, the reality is completely the other way around. Though I have no clue why our music, literature and art products did not succeed to transmit our jovial side, the reality shows that we all have naturally ironical and humorous way of expressing our misfortunes when it is over. If our misfortunes did not completely destroy us, they most probably end up being hilarious jokes that we never tired of reciting for the rest of our lives. I am sure, laughing at our past and present hardships is the best medicine that helped us to endure many hardships that occurred in our society for the past endless years. Yes, the story of our hardship is endless. That also means that we have endless gushing streams of humor-loaded stories. 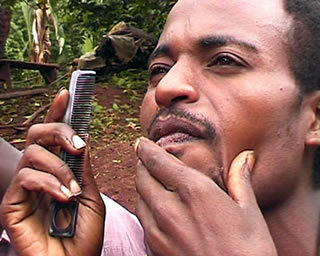 This video was recorded some years ago in Addis. We were sitting in the good old café of Cinema Ambassador. Ambassador café has not lost its old flair even though it visibly became old and shabby. Actually, the right place to rewind and travel through past memories. I laughed on that day the way I hadn’t for a long long time. Most of the stories were told by Moni. He is always so funny that his way of telling stories makes one think that Moni could be a great stand-up comedian if he were somewhere else where talents like his be appreciated and paid for. In this video, Moni is telling us a story on how he and his friend spontaneously attended a funeral ceremony on their way home. For they were too hungry to walk on and for they had no money in their pockets, they thought that joining the funeral ceremony would be the easiest way to have a quick meal. As they assumed, they had a nice meal for sure. But they haven’t predicted what the consequence would be, when the others in that tent get aware of two complete strangers who were only there to fill their bellies but not to pay respect for the departed…. The old man’s story is obviously taking us on a completely different route than I assumed. But I am not interrupting him. Maybe it is because I am also beginning to think about my own mother and about the stories she used to tell me. Maybe it is because that was my first time to reconsider: No matter how old we are, we all will be haunted by this deeply planted wish to run back to the protecting warmth of our mothers in order to escape from misfortunes of our everyday life. So, seeing how deeply he was involved with this thoughts of his mother’s memory, I decided not to interrupt him and change the subject towards our main issue which was about his conflict with his wife. Instead, just to let his mood flow, I asked him to tell me more about his mother and his childhood years. As I have predicted, he was glad about my interest. As a result, the attitude of his narration was free of mistrust towards my reaction. I could tell that because he was now openly referring his mother as “Emaye…“(Equivalent to mommy in English). That was quite strange to hear a seventy years old man addressing his mother using that terminology. The old man was quite for a while. Taken away by his story, I sat still and said nothing. In this uneasy silence, I felt a cloud of sadness lingering above us. I could see, he was fighting back his emotion. I kept silent knowing that whatever I would say, would make him more sad. I had no answer for his question for it was more a statement than a question. Sorry for the delayed continuation. We hope you enjoyed the story. In one of my earlier posts I have written a story about Degu (link to the previous article). 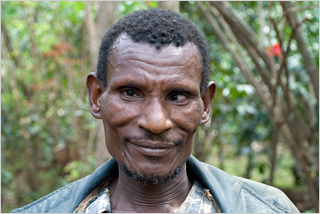 I met him again in my recent journey to Ethiopia. Here is more about Degu. Degu did not show up the way he used to. Usually he used to come over on the second or third day of my arrival. As days went by and as he still didn’t show up I was forced to ask the others how he was doing. Degu seldom comes out of his mother’s hut for several months, they said. He is too afraid to face the world outside. Though I was glad that he was living with his mother again but it made me sad that things did not seem to go well for him. If he was hiding from everyone like that, there might not be any chance to stabilize his life to normal again. So I intended to visit him. Like fifty meters from their compound I sent a kid to look if Degu was at home. The kid said that he would definitely be at home. So I told to tell him that I am waiting outside. It must have taken quite a long time to convince Degu to come out their hut and meet me because I have waited for at least 15 minutes.As Degu came to where I was standing, I could see that he was struggling to adjust his eyes to the bright sunlight of that afternoon. He was visibly glad to see me and his smile filled his face with life. After we greeted each other I asked him how he was doing. Degu didn’t answer my question because he was too self conscious of the eager spectators who were gathering around us. Seeing that he was too nervous that we were talking on an open street grasping everybody’s attention, I proposed to go to a secluded place where we could have more privacy. Degu was happy with the idea. Degu has never been a person of many words. His extra ordinary long sentence which he just used to describe his current life situation was his way of letting me know not to ask him any more question. Though I had a lot in mind to say, I just respected his wish and changed the subject. For the very first time Degu did not mention about his video message: a message that we have recorded some years ago to find him a woman in the west who would be interested to marry him. I was in Ethiopia a month ago. Visiting my old mother and to be in the middle of the green nature of my hometown Yirga Cheffe was the purpose of my journey. Just as I intended, I spent there the most part of my vacation. It is almost three years since my last visit to Yirga Cheffe. After witnessing the surprisingly endless building constructions in Addis Abeba and Awassa, I thought there might be some progressive changes in my hometown as well. Unfortunately, Yirga Cheffe is still not awake from it’s sleep. I was astonished to see that every corner of the town has remained the same. In Yirga Cheffe it felt as if the time has stopped moving freezing everything around it at the same time. 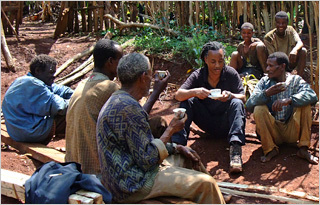 “Yirga Cheffe” called the well known organic coffee which for example is part of the assortments of Starbucks and co. But the town looks like as if it hasn’t seen a cent from the merchandising process of its name and its natural treasure. There is again a new mayor assigned on the highest position of the town hall. This must be the fifth or the sixth mayor in the last 7 or 8 years. Friends have told me the reason of this too frequently changing position is corruption. I am of course in no position of confirming or proofing this allegation because usually people in that area tend to attach every higher position or wealth with corruption. Any ways, it turned out to be a tiresome procedure for me to go to that office on each of my arrival and recite again and again my wish to establish a beneficiary project. Instead, I concentrated my self on more promising social issues of the town that could be worthwhile to write about. 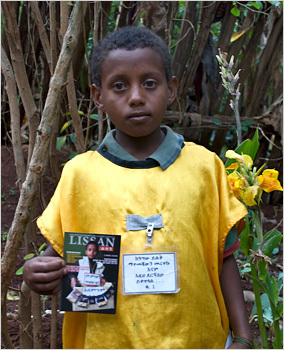 Three years ago, on my last journey to Yirga Cheffe, I met this 9 years old kid Mulugeta. I was sitting on the veranda of Mahlet Restaurant chatting with some old friends and having coffee and Ambo Water. Mulugeta was selling small articles like cigarettes and chewing gums carrying in a big carton that obviously looked quite heavy for his age. What grabbed my attention about his appearance was a small paper board with a striking message hanging upon his chest with a thread around his neck. The message on the board reads like “Give me a fishing rod instead of a fish”. And below on the Carton was another message that went “I don’t want to beg”. I was so impressed from his message and confident appearance. I asked him quickly if I could take a photo of him. He said ok and I gave him some Birr after taking a single picture. I wasn’t aware of the impact of that picture at that time. But after returning to Germany, I was surprised by the symbolic power of the picture. Since then it has been in the front page of Lissan Magazine. I had this great wish to meet Mulugeta again on my next trip to see how he has been doing and to repay him for the challenging power of his message. The bus journey from Addis to Yirga Cheffe was interesting as usual. 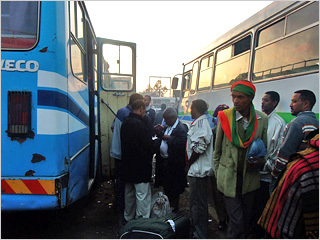 One of the things that never changes in Addis is the early morning atmosphere of its bus terminal. I was with my younger brother Yohannes who came a day before to Addis to pick me up. In the semi-darkness of the dawn, me and Yohannes had quite a difficult time finding our way to our bus through hundreds of passengers who were carrying and pulling their luggages. The air was thick through the suffocating smoke from buses that had their motors running all the time. We were glad to be in the bus after waiting for almost 2 uncomfortable hours. 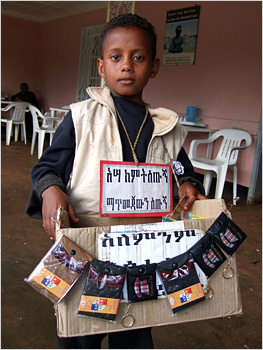 After arriving in Yirga Cheffe after 8 hours journey I saw a kid selling stuff around the terminal with a small message attached to his t-shirt. The message written was “Development starts right from here.” I was sure that he was Mulugeta. I was happy about the coincidence and went directly to where the kid was standing. “He is somewhere in the town but I can call him for you.” Said the brother eagerly. So we agreed to meet at my mothers house after an hour. That gave me enough time to go through with the greeting ceremony with my relatives who were waiting for me at home. 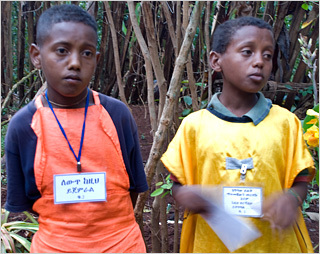 Mulugeta and his brother arrived together. I was glad to see them because they were quite identical and both had interesting messages sticked to their t-shirts. I asked Mulugeta if he has recognised me. He said he hasn’t. I told him about that picutre I took of him three years ago and I showed him the Lissan flyer with his image on it. Mulugeta was glad to see his picture on the flyer. He and his brother have taken the news in a rather grown-up and businessmen manner. They told me about their family background and how they support their parents through their work. 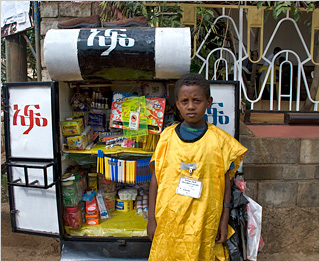 Mulugeta asked me to come and see his small kiosk in middle of the town. He said proudly that he spent 500 Birr to build his kiosk and he has now 2000 Birr capital. 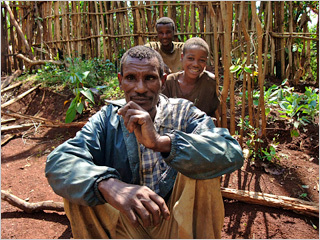 Mulugeta and his brother asked me; in case I want to write about them I should also mention the guy who helped them to start with their survival project. His name is Taye and the kids call him Misr, a student who loves to write nostalgic poems and to organize art and music events in Yirga Cheffe. Taye tries to help street kids to support themselves. I met him after two days in Yirga Cheffe. 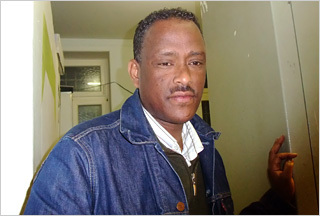 He told me that he was suspicious about me after seeing the flyer with Mulugeta’s image. He said that I might have gained some advantage using that picture. I was glad to see his suspicion vanishing after we discussed the matter for a while. There are more stories to come from Taye. He has promised to keep me informed about his project by sending articles for Lissan. The Winter has finally taken control of the environment. The days are filled with a creepy cold weather. If we had at least snow, it would have improved this gloomy view with its light. But to have snow in Frankfurt in Winter is like winning in a lottery. Here in Frankfurt, there is a place called Arat Kilo. Not a square like we know back in Addis. Arat Kilo is a very small kiosk in the center of the city and I can assume myself as a regular visitor of the kiosk for the last six months. Looking at Arat Kilo kiosk from outside, one would most probably not imagine to go inside and sit there for hours. It is actually a small shop with two tiny rooms that are stuffed with two computers for surfing, a telephone booth for international calls, three refrigerators for beverages, various shelves for cigarettes and other articles. One can almost be astonished how much stuff can be filled in to such a small place. Usually on weekends, among all these furnishings, about 8 to 10 regular Ethiopian customers like me (mostly men) find a place to sit, to have beer and to chat. 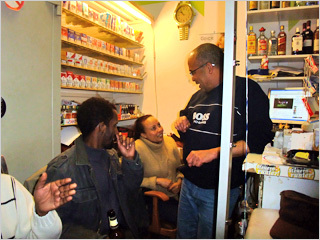 One meets here interesting individuals from different social, intellect, and economical background The atmosphere is like in a liquor grocery in Addis. I could say that I learned here to see at the vast and interesting diversities and similarities of my fellow Ethiopians living in this city. 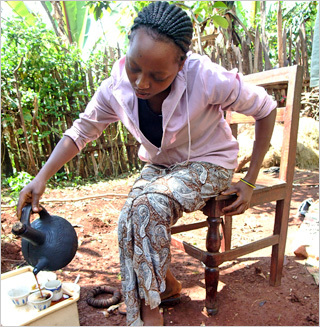 I met Tesfa in Arat Kilo two months ago. 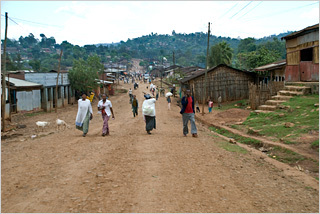 I was once speaking about my town Dilla in south Ethiopia where some of my relatives live. 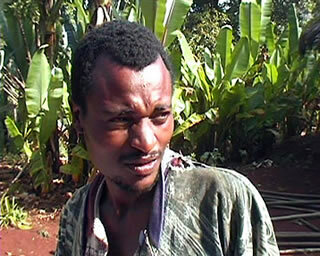 Tesfa told me that he has visited the town and spent there once two weeks. I was a bit amazed about that because I heard him speaking with other customers about many other towns in that same manner. So I asked him how did it come that he knew so many small towns and villages in Ethiopia. That is when he told me his story. 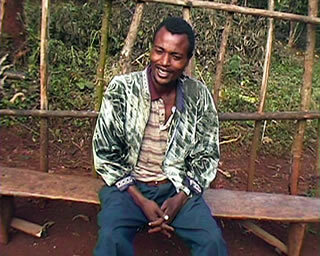 Tesfa has traveled allover Ethiopia three times on a standard bicycle. 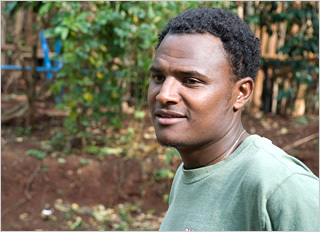 Each time, Tesfa started his bicycle journey from Bahir Dar. That is where he originally came from. Ha rod then towards Addis Abeba where he had to go through various organizing processes of official and financial manners. His motto for his bicycle journey was “Peace for Children”. For he was only armed with this motto, he was financially fully dependent on the generosity of his fellow citizens, who were obviously enthusiastic of his motivation and courage to undertake such a difficult mission alone. 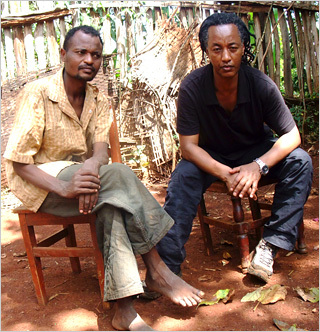 Tesfa told me how he used to attract attention in every destination of his journey. Usually, it was enough to visit a popular restaurant or a bar of a town. Then people start to gather around his unnaturally and heavily-loaded bicycle. The farther he came away from his starting point, the more the astonishment and the appreciation of the people. 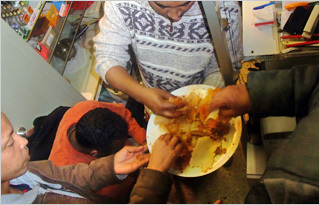 Very often the occasion ended up in an almost same manner: some of the spectators would offer him to pay his bills encouraging him to eat what ever and how much he wants to eat, and some would start on the spot to collect money for him. In case he has stayed in a certain town for few days, his popularity would spread around quickly and so also the the invitations and the donations. 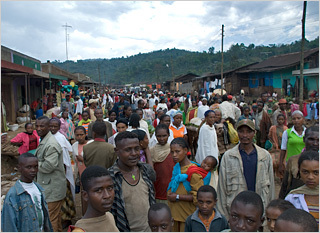 Once Tesfa recalls witnessing from afar and along his route a large group of men and women marching on the street raising the national flag in front. He mistook this march for some kind of demonstration at first because those people were chanting and cheering loudly. Though he didn’t feel comfortable about the incident, he couldn’t change his direction because there was no alternative route. Heading towards the gathering was unavoidable. The assumed demonstration turned out to be a funeral march. It was just a tradition for that area that funerals are attended in a rather cheerful manner. Tesfa has joined the funeral march because the whole atmosphere touched him in a positively dignifying way. There where he grew up, funerals have quite the opposite atitude. In the mean time, what he has not noticed on this moment was that he has been equally attracting the attention of those marching people. Ever since he has joined the funeral procession, they have been wondering about this stranger and his oerloaded bicycle. After the funeral they have satisfied their eagerness after asking him as many questions as they could. To show him how they were honored that he joined them and their admiration about his exceptional journey, they have collected and gave him some money before cheerfully bidding him farewell. Tesfa today. He still dreams of going on further bicycle journies. 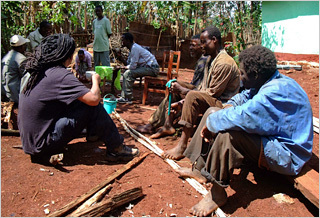 Tesfa has learned to understand his country men and women and grew to respect and love their regions and traditions . Of course, he also has came across many difficult moments especially when he slept in wilderness all alone and when he has to stay awake afraid of being eaten by wild animals or being robbed by hostile thieves(that has occurred few times). But in spite of the danger, the positive side of his journey was overwhelming. He continuesly was inspired by his motto and motivated by the reaction of the population which led him to make his tour three times. Tesfa told me that he was the second person to travel Ethiopia on a bicycle but no one has done that three times before him. 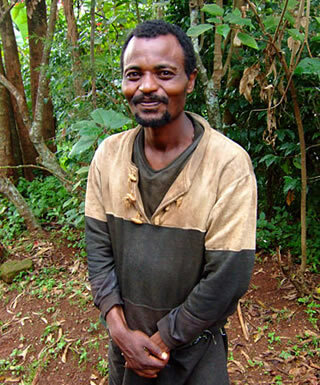 If you meet Tesfa and tell him from which part of Ethiopia you came from, he will most probably tell you about every important detail about your home town. 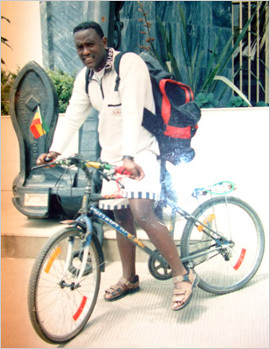 Tesfa’s greatest wish is to travel around the world on a bicycle under the same motto. I am convinced, he will do that if he finds a proper sponsor. I wish him good luck in fulfilling this dream and encourage all interested groups and individuals out there to help him in any possible way.